This time of year I am always looking for new zucchini recipes. My family gets tired of seeing zucchini over and over. My friend told me about an old Taste of Home recipe that was in a cookbook we both have. I thought it sounded like a fun, easy, and frugal dinner idea. But, the first time I made this “pizza” my family did not know what to think. The recipe calls it pizza, but it is not really like a real pizza. This is how the conversation with my son went the first time we had this. He said, “Ok” and ran off. So, this dinner is really good, but if you serve it to your family you might want to rename it. Otherwise you might be having a similar conversation. In a bowl, combine zucchini, rice, mozzarella cheese, Parmesan cheese and eggs until well blended. Press mixture into a greased 15-in. x 11-in. x 1-in. baking pan. Bake at 400° for 20-25 minutes or until the crust is set and lightly browned. Meanwhile, brown ground beef and onion; drain. Stir in spaghetti sauce, oregano and salt. Mix well. 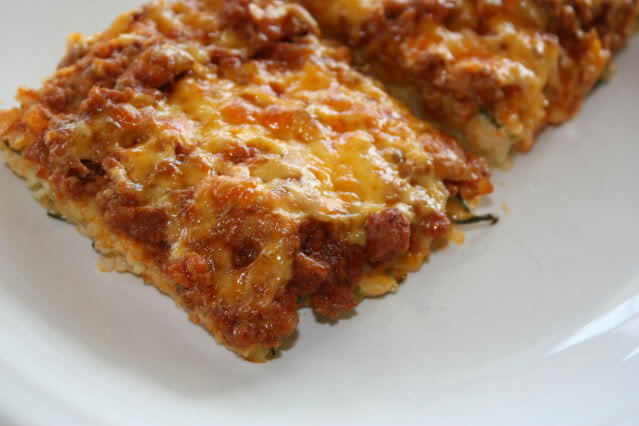 Spoon beef mixture over zucchini crust. Sprinkle with cheddar cheese. Bake at 400° for 15 minutes. Let stand 5 minutes before serving. I have made zucchini pizza. I recomend making the crust out of Zucchini only. Shred it, drain and dry it, press it into a circle, prepare as regular pizza. Worked fine and we had no questions. Another idea for zucchini that I love is to shred it, saute it in olive oil with garlic and tomatos and use it as an alternative layer in lasagna. I generally replace the cheese layer with the vegetables. Our entire family loves it! I served this last week and the family enjoyed this very much. The only thing I did different was add less cheese to the crust and 1/2 cup of lowfat ricotta. We were low on cheddar. But it turned out yummy all the same. That looks sooo yummy! Great use of the zuke. Oh, my goodness! I made this for my family tonight and we all LOVED it! Even my one-year-old son gobbled it right up. Thank you for all the great recipes! @Amanda, I am so glad you liked this. My kids love it too. It is a great way to get kids to eat zucchini. I was thinking Zucchini Lasagna and then I read Anne’s comment about how she incorporates lasagna noodles, and it’s going to have to be tried here…since I have two huge zucchinis on my counter! Thanks for the idea. I found you through Premeditated Leftovers today. @Rebecca in Colorado, I am so glad that you found my site. We love this recipe. I hope that you enjoy it also. @SarahKL @ the Ooey Gooey Daily News, I usually just put the zuch. in a colander or strainer and press down on it, this works pretty well. You can also use a kitchen towel and squeeze it out in that, but I find that way messy. I hope that helps! I would say call it whatever will make your family want to eat it. 🙂 I love this recipe because it is so easy and it is gluten free. I really think you could use other toppings for this and have it be really good on the crust. I hope you enjoy it! I do not have the size pan you call for. Would you use a 9×13 or a “cookie” sheet? Yes, you can use a different pan the crust will just be a different thickness. If you use a 9×13 I might do it in a 9×13 and an 8×8 or something like that. It might be too thick to make all of it in just one 9×13. Or any cookie sheet type pan should work as well. Hi. I made this tonight and I, and my 2 1/2 year old, loved it too. Getting him to eat veggies isn’t always easy so this made me happy! I used some different meats, added peppers, and topped the whole thing with chopped tomatoes and olive tapenade. Yum! I also made your no bake chocolate cheesecake this week too. Before this I never met a no bake cheesecake I liked. I can’t say that anymore. I used 2 dark chocolate bars and mixed fat free and reduced fat cream cheeses and did 2/3 the recipe on a prepared graham cracker crust. You made a believer out of me. Thanks! Thank you so much for letting me know you enjoyed both the zucchini pizza and the cheesecake. Both are favorites at our house and I love hearing that others enjoy them also. this was so good!!! Family enjoyed and had most of items while using from the pantry this week!! thanks for recipe!